Tiny billionth-of-a-meter sized clusters of gold atoms — gold “nanoparticles” — are being widely studied by scientists. They have many useful potential applications, from carriers for cancer-treatment drugs to digital data storage. But many of these applications, particularly those in electronics, require that the nanoparticles form ordered arrays that can be hard to achieve. 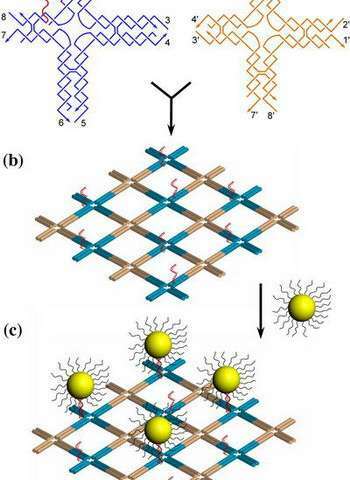 At Arizona State University (ASU), researchers have discovered that grids made of DNA strands are excellent templates for neatly organizing gold nanoparticles. Yan and his research group used gold nanoparticles that were five nanometers in diameter. Rather than being bare, the particles were coated with a layer of DNA “pieces,” called “T15 sequences,” which radiated from the particles’ surfaces like arms. The scientists then deposited the particles onto lattices formed by two types of cross-shaped DNA “tiles”, “A” tiles and “B” tiles, that bind together in an alternating fashion to form the DNA grid. This configuration caused the nanoparticles to “self assemble” into a square pattern — each particle sitting on one A tile — with a nearly constant particle-particle distance of about 38 nanometers. The group confirmed this using an atomic force microscope, a very powerful imaging device. However, this result, while welcomed by the scientists, wasn’t exactly what they expected. The scientists guess that this is due to the T15 sequence layer, which effectively increases the diameter of each nanoparticle and, moreover, makes each particle highly negatively charged. As a result, the nanoparticles repel each other if they are too close together, which limits the minimum particle-particle distance. Therefore, a particle located at the center of the square would violate this limit. In future research, Yan and may try to use this organization method to form more complex nanoparticle arrays, such as denser patterns or patterns of different shapes, by altering the particles’ DNA coating. Carrying and releasing nanoscale cargo with "nanowrappers"